The antics of the Jewish Defence League (UK) have gone on for far too long. The Director of the Jewish Defence League is Roberta Moore and her role in the English Defence League as well as her Kahanist outlook is well documented and can be found here. Roberta Moore, it seems, finally realised that there were anti-Semitic individuals in the English Defence League before she left, a stance that she holds and which many would say is simply because she fell out with the leadership. Whatever the situation, Roberta Moore as Director of the Jewish Defence League is liable for these comments emanating from the Jewish Defence League (UK’s) account. We have consistently taken the position that anti-Semitism and anti-Muslim hate should be countered whether within Jewish or Muslim communities. In fact, just a few days ago, we made this clear on our site. 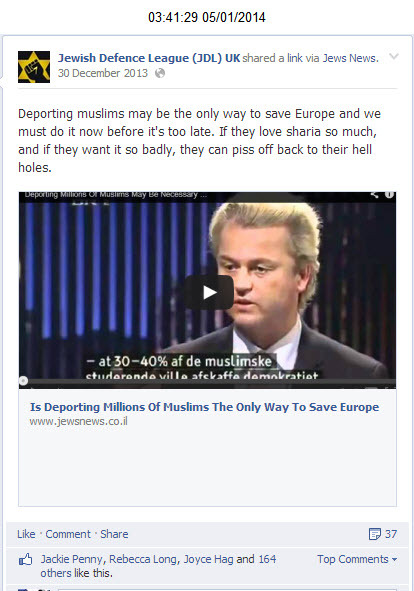 Having had the Jewish Defence League (UK) Facebook reported into us today, we are truly shocked at the virulent anti-Muslim hate that is promoted by Roberta Moore and her group. This is not ‘free-speech,’ this is extreme hate speech and we will be notifying the police about this. Furthermore, we are saddened to see Mrs Ambrosine Shitrit (Chetrit), popping up on the Jewish Defence League (UK) Facebook page in a posting. 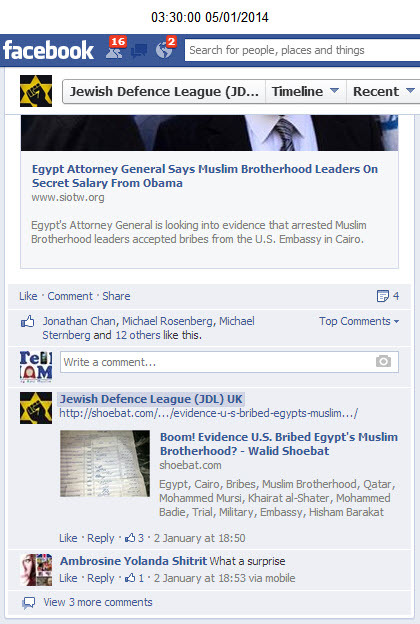 These are some of the postings on the Jewish Defence League (UK) web-site. We must warn readers, some of the language is not only racist, it is virulently anti-Muslim in nature. 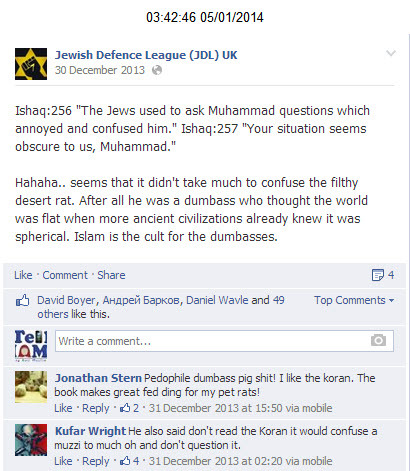 Here is another post which effectively calls the Prophet of Islam and Muslims, a ‘filthy desert rat.’ This is followed by a tirade of hate speech showing what kind of individuals the Jewish Defence League (UK) Facebook site attracts. Well, it clearly does not end here. 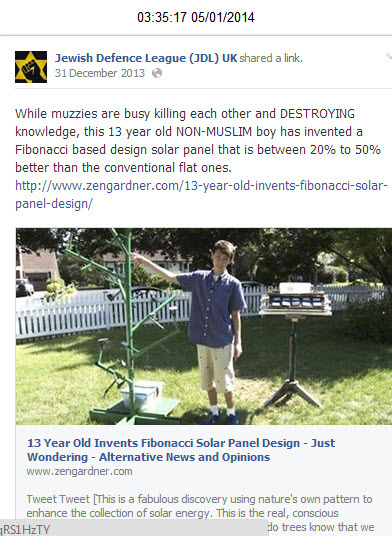 Here is a further set of posts suggesting that ‘Muzzies’ are effectively monsters who destroy knowledge and who are unable to have intelligent children. Or take the posting below this one, which you can all read, is just frankly, unbelievable. Is she trying to imply that black people, including the President of the United States of America, are……….? To top it all off, Roberta Moore’s Jewish Defence League (UK) calls the President of the United States, a Nazi! Which brings us onto our last set of screenshots that were sent to us. 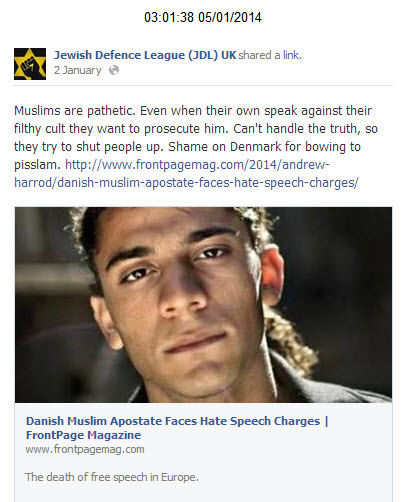 Sadly, it involves Ambrosine Shitrit (Chetrit) posting onto the Jewish Defence League (UK) Facebook page. Readers of our blog will have previously come across Ambrosine Shitrit (Chetrit) in this following post. Finally, to top it all off, the Jewish Defence League makes great play that it is the defender of Israel, something that you would expect would mean that they do not call the Prime Minister of Israel one of the most disgraceful and highly offensive terms that a Jew can be called. 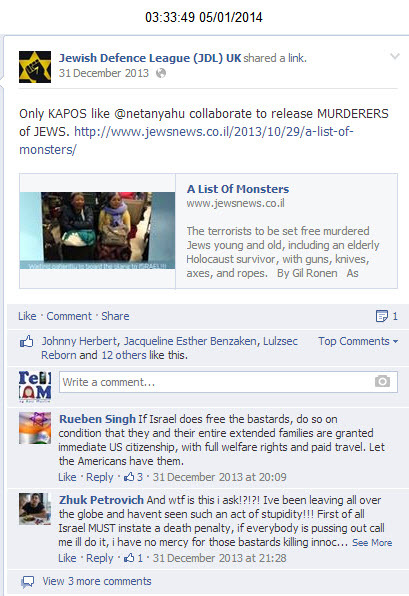 Roberta Moore’s Jewish Defence League (UK) calls Prime Minister Netanyahu, a ‘kapo‘. She effectively calls him a collaborator with the Nazis and kapos were forced by SS guards to work other Jews, in the hope that their lives would be spared. It has become a deeply derogatory term for Nazi collaborators. 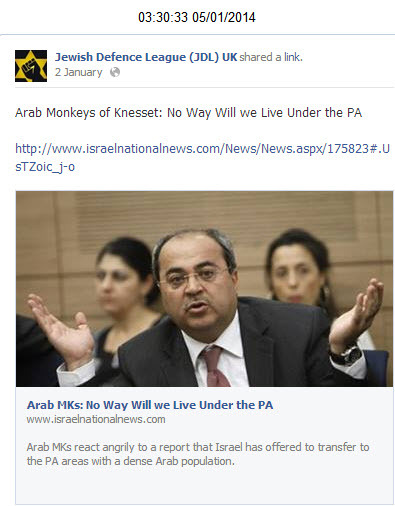 So much for defenders of Israel we say, the Jewish Defence League (UK) has become more of a liability. (All this material has been passed onto the Metropolitan Police Service for their review).